With no interval or tempo run since March 2014 and low number of runs beyond 21Km (several of which were a struggle) starting from October, I was aware that I was in no shape to race hard in SCMM 2015. Nevertheless, (perhaps foolishly in hindsight) I set myself a loose, albeit, aggressive goal of trying to finish between 3:45 and 3:50. I ended up struggling to the finish line in just under 4 hours in 3:57:40 - my slowest finish since the 4:00:56 of 2010!! It was one of those runs where I never hit a rhythm;Within the first 5 Kms my legs - specially the left one - started to feel heavy and lethargic. While I started along with other runners who were targeting around 3:45 very early on I slowed down and even started mentally revisiting my timing goal.I ran a fairly steady pace till the sea link (about 16Km) but from there on slowed down considerably. The legs just would not move fast enough. In addition to the dull pain in the left hamstring and calf and slight numbness in the left sole, I also felt pain in a toe of the right leg. Later I discovered a blister in that toe and realised that I had made the mistake of wearing the wrong socks for the race. Wearing thick cotton socks (double layer in the left leg) - one that I had not raced in for a long time - was a very stupid and unconscionable error considering my running experience. Hitting the half way mark in about 1:52 I knew anywhere close to 3:45 was going to be impossible. I was still hopeful of about 3:50. However, I did not manage a single sub 5:30 Km in the second half and logged over 6 min Kms in the last 7 Kms when several runners overtook me. Somewhere around 30Km I knew I would have to push harder to finish even under 3:55 which I was just unable to do so. There were just too many negative thoughts going through my mind and for the first time in 12 years I sensed I was not enjoying SCMM. 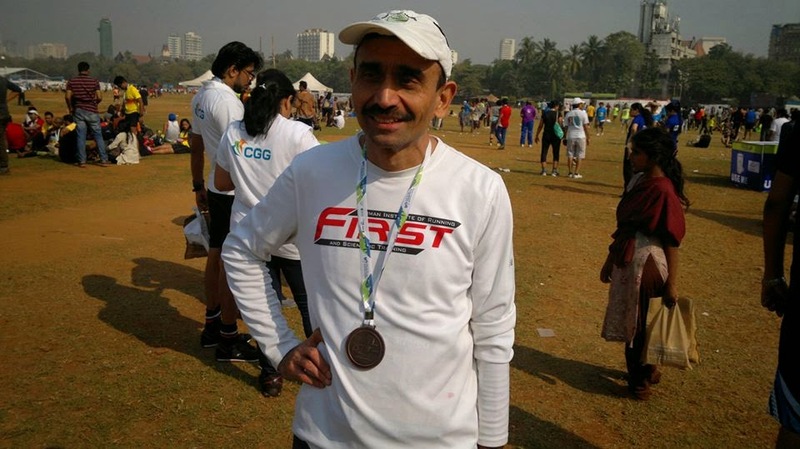 I then knew I was beaten both physically and mentally and decided to make an effort to have fun and started acknowledging the spectators, volunteers and Mumbai cops along the way - they as usual did a fantastic job in supporting the race and the runners. This possibly gave me a bit of positive energy that enabled me to squeak through in just 4 hours. My Garmin showed that I had run 42.78Kms in 3:58 - over running the marathon distance even more than usual was another reflection of my state of mind. Cannot attribute any single reason to justify my below par run - the wrong pair of socks, about 10% more than optimal weight, inability to regain fitness level in 8 weeks training , work related stress , travel in the last 4 weeks leading up to the race and lack of motivation to dig deep and push myself were all contributors. Though a bit warmer compared to the previous two years weather was not a factor as far a I was concerned. The dull pain in the hamstring and numbness in the sole disappeared soon after the race though soreness in the glutes stayed for a few days. The race itself was quite well organised. 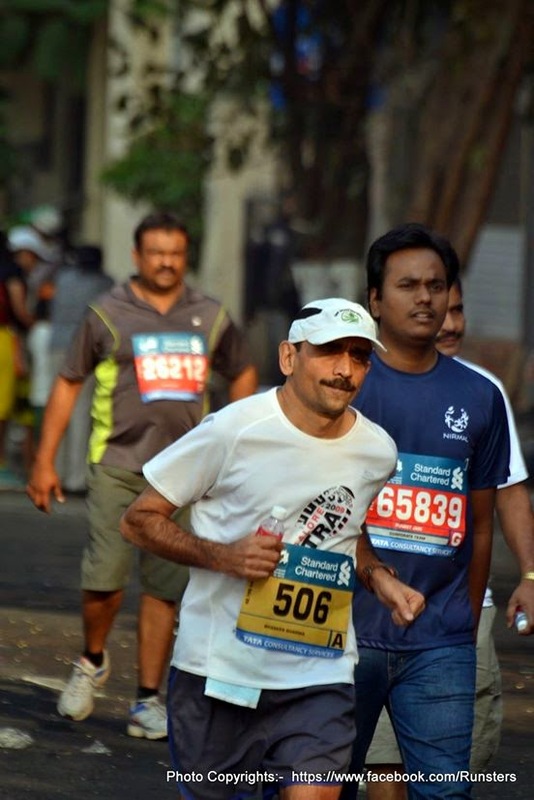 The additional security to enter the Azad maidan in the morning resulted in long queues and slow processing of runners with bags - causing a bit of a nervousness among runners. The mass urinals in the maidan was a nice new addition - reducing the waiting time for the port-a-potties and also avoiding men from urinating in the open in the ground. While the volunteers tried to create a clear path for FM runners in the last few Kms by moving the slow dream runners to one side the FM runners with stringent time target still had to weave through them. However, the handling of runners after crossing the finish line was very disappointing. There was no medals or water in the area after the finish line and insufficient number of volunteers directing the runners to the medals/refreshment counters. After collecting the same runners had to climb a bunch of steps to enter the maidan. Due to the large number of half marathon finishers this took me nearly 15 very irritating minutes ! As has been my practice I landed in Mumbai Friday 16th January evening and stayed again in Govandi this year (after the break of last year). The bib collection process on Saturday morning took just 5 minutes - the expo was shifted to Phoenix city market in Kurla for the first time making it convenient for runners in the suburbs. Hung around with runners for a couple of hours before returning home for lunch and putting up my feet. Co-ordinated with fellow Bangalore runner Amit to travel to the start point together on Sunday morning. I managed a little over 5 hours sleep between 9:45 and 3 am. 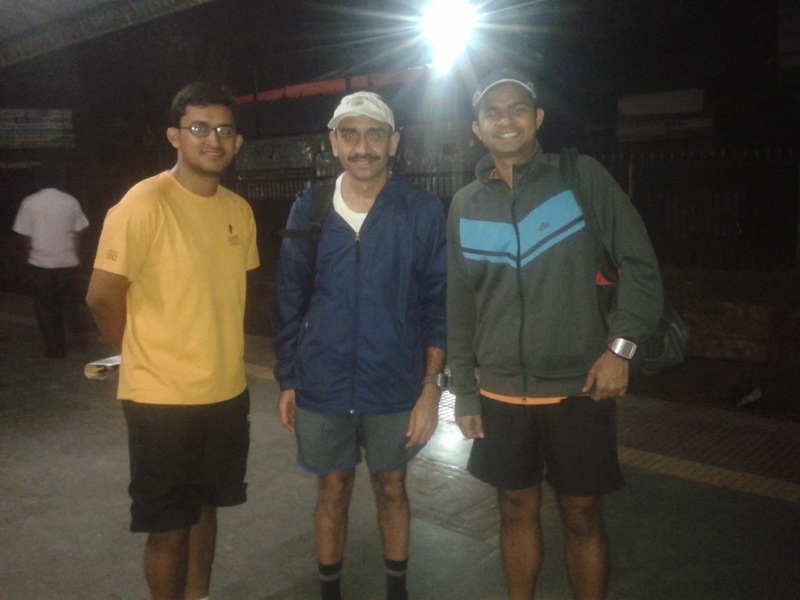 Amit picked me up from Govandi at 3:55am and he, myself and a 3rd runner called Umang took the 4:15 train from Chembur to reach VT station comfortably by 4:50am. As usual the train was filled with runners and VT station was abuzz with their energy. 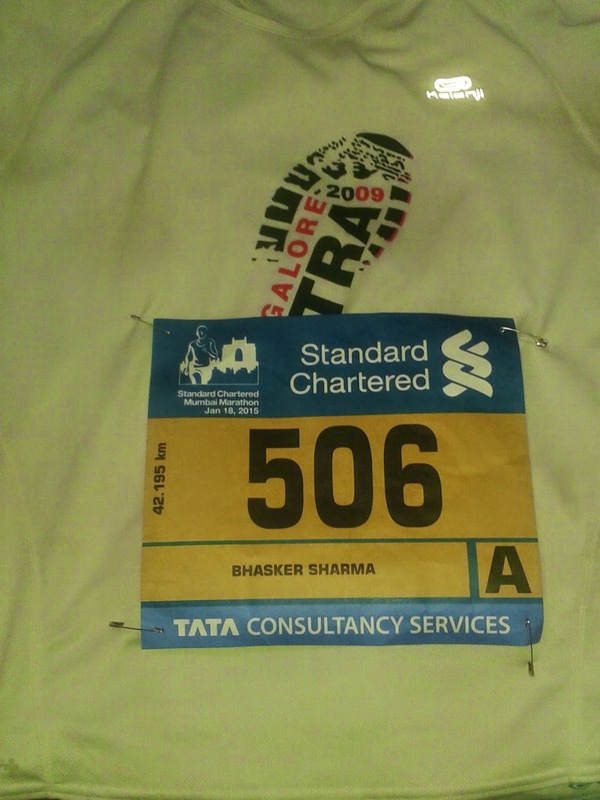 After hanging around in Azad maidan for a couple of hours post the race I returned home. After a quick lunch I headed to the airport to catch a 5:15PM flight back to Bangalore pondering the need to re-evaluate my injury recovery progress and strategy as well as the training plans and race distances for the year! Probably the topic for my next post. A very comprehensive post with lots of info and great images collection. Love to this post. Thanks for sharing such a nice information . you can also visit .